God is so good to have opened another door so others can learn about the Daniel Fast! I appear on Paula White’s television ministry program on January 6th and 7th where we talk about the Daniel Fast and its many benefits. You can check your Christian television schedule to learn of when the show will broadcast in your area . . .
Also, watch the videos. It’s all there to help you and give you the answers you desire. Unsweetened additive free Coconut milk is fine for use in recipes and on cereal just not as a drinking beverage, water is the only drinking beverage on the fast. Be Blessed! 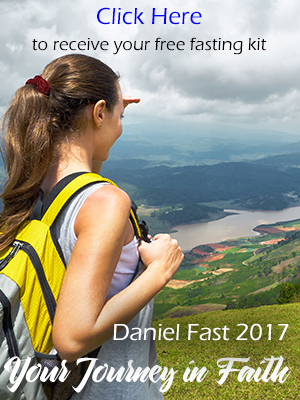 I want to start the Daniel, fast. Is pure coconut water okay to drink? Thank you Sean for your kind words! Be Blessed in your journey! I, too, first came across you and your book watching the interview on Paula White. You came across as genuine, authentic, clear. I appreciated that. You made the information easy to understand, and most of all, your focus was on the spirituality and not the foodology/foodolatry, lol. I’m a guy who was looking for a way to hear God better, and you made me say, “Hmmm…a way?” I bought the book and shared it with family, too. Thank you and Paula and Godspeed. This is my third day and I’m beginning to plan ahead far as my meals so I CAN STAY on track with is vital for us to be able to complete this fast and also GOD want us to be ready for HIM in whatever capacity.